Now its time to say thank you for our fabulous sponsor - here is what the team has for you. Creative Dies Tag and Sentiment die. 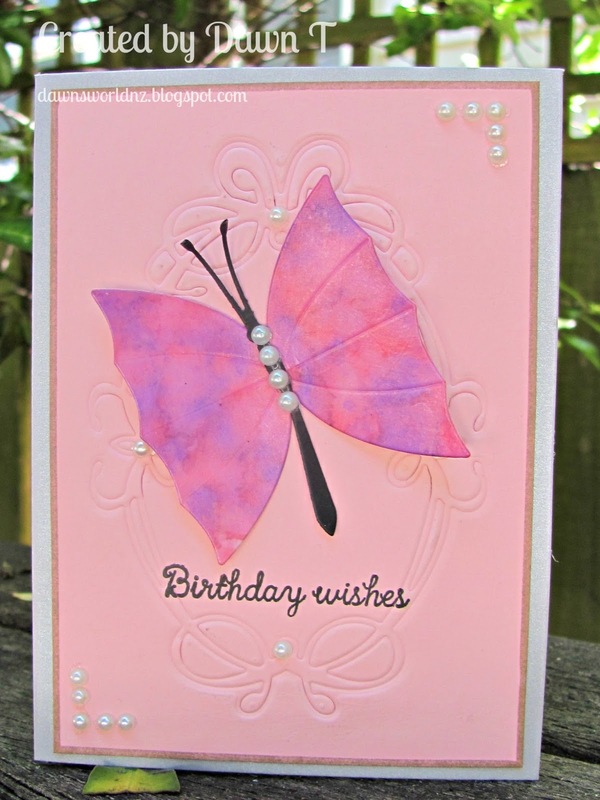 Although today my card uses a Hero Arts butterfly die, our sponsor has a lot of lovely dies you could use. This is a new die cut for me from Arlene. I loved it so much that I have bought it! Today I am sharing a "pattern on pattern" project. And I am using the Tags & More 3 - Leaves cutting die by Elizabeth Craft Design which is available at One Happy Cut. 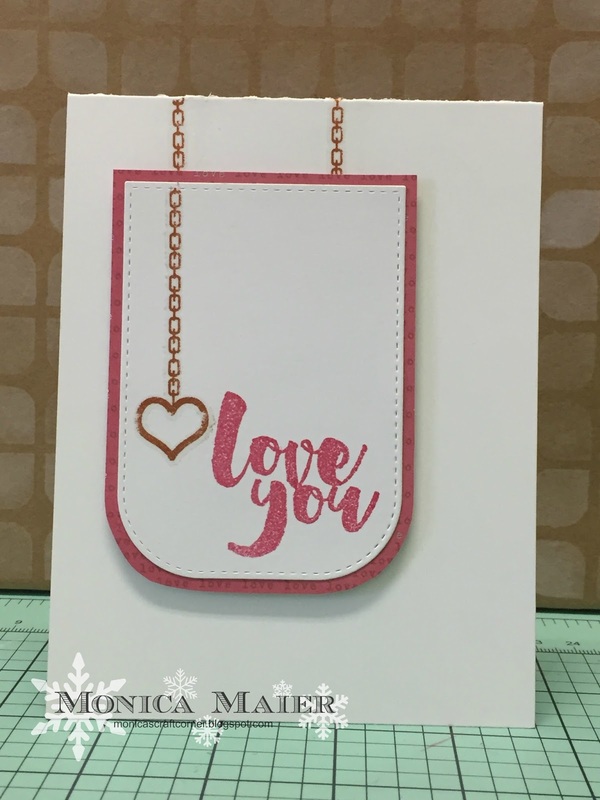 I wanted to create a less feminine Valentine so I went with some neutral color card stock. 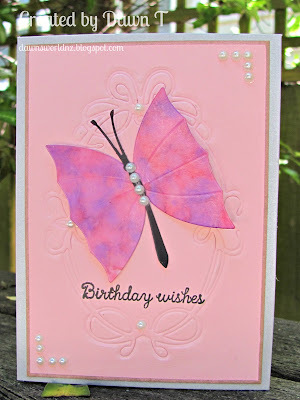 But I can't help myself but to use some crimson and pink pattern paper and for the stamping. What do you think? Is it less feminine than the floral kind? 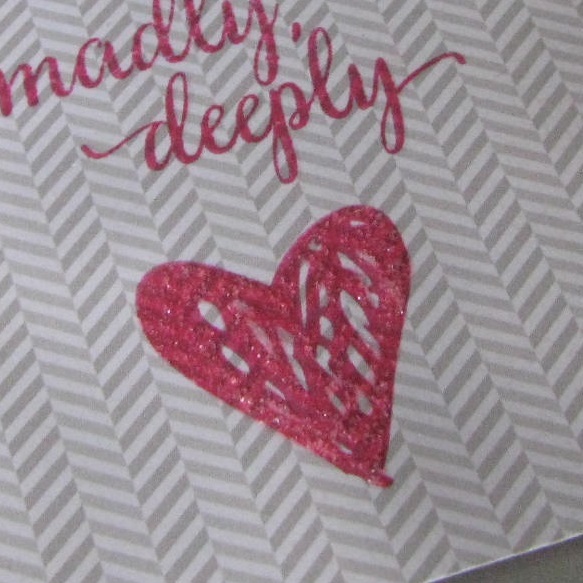 I used a clear gel pen to go over the sentiment adding a little more interest, and added Stickles (Sprinkled Sugar) to the etched heart. Both these stamps are new additions to my stash. 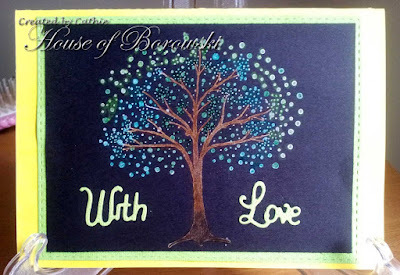 There is still time to play our January challenge: new technique/die/stamp/colors, something you're using or trying for the first time. Our sponsor this month is One Happy Cut. Winner of this month's challenge would receive a $15 gift certificate to their store. The challenge is new technique, die, stamp, colors, something you're using or trying for the first time. Well, here is something I've never tried before and have been thinking about doing, so here we go. I'm using my die-cuts to expand my die-cut house into a large home. I also am using up scraps. 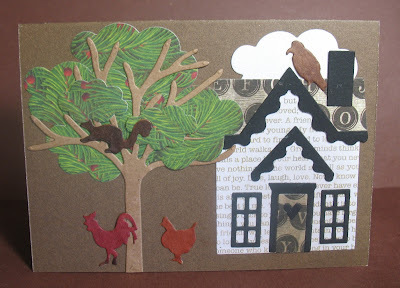 I glued leftover scraps of paper from different projects onto a piece of copy paper. 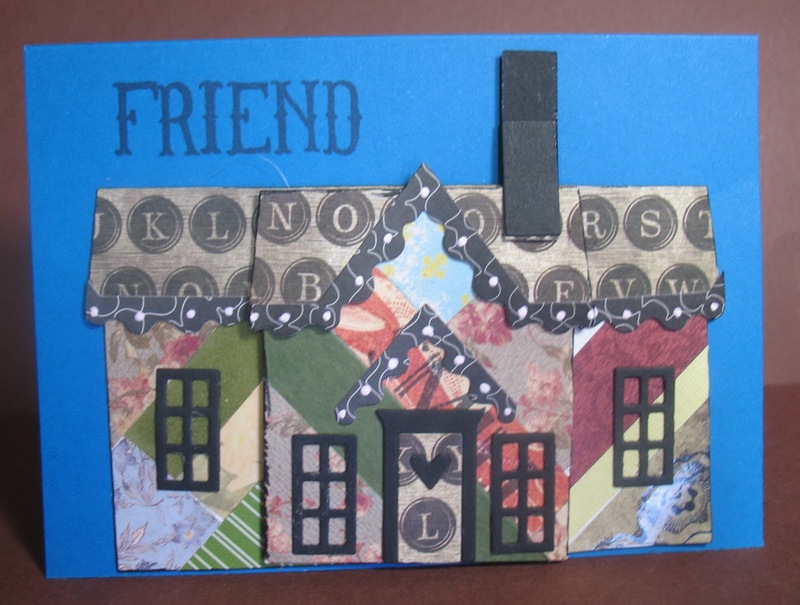 I then die-cut the house three times from the scrap paper and glued two of the houses onto a piece of copy paper. The long roof is the same width as the roof die and glued on top of the two houses. The third house is pop dotted to the top middle of the two houses. I cut the chimney twice and layered one piece behind the other. I cut four windows and glued them on. I cut two doors to create a door with different paper. I used a white ink pen to dot the trim. This really lightened up the entire house. 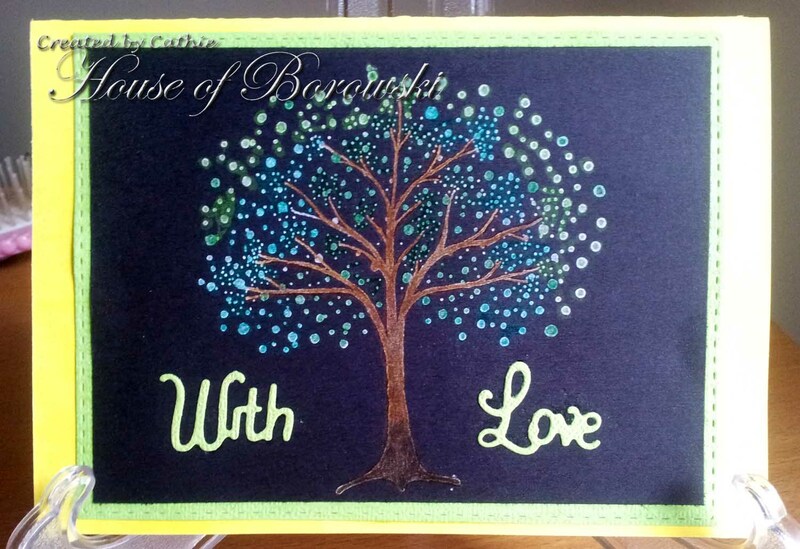 I found blue card stock and cut to A2 card size and adhered the houses onto the note card. I love making New Baby cards. They always mean so much to the new parents. I like using gingham card on a baby card. I have die cut various baby embellishments. I have die cut the chassis of the pram in mirror card for a realistic effect. The entries are lovely, keep them coming. I love flamingos (even though they are my least favorite color), so I couldn't pass up this little guy when he showed up on a Valentines day display at work recently! 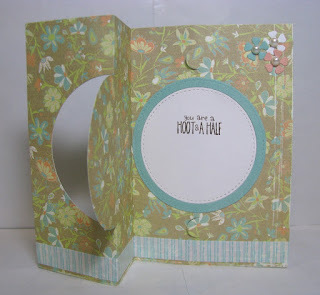 The pattern papers are scraps from an older collection, that I pieced together on the card base. 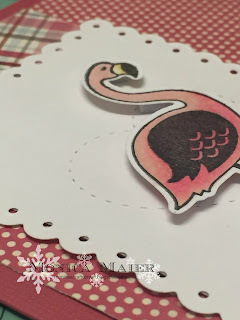 I die cut and colored the flamingo before adding him to the die cut panel. 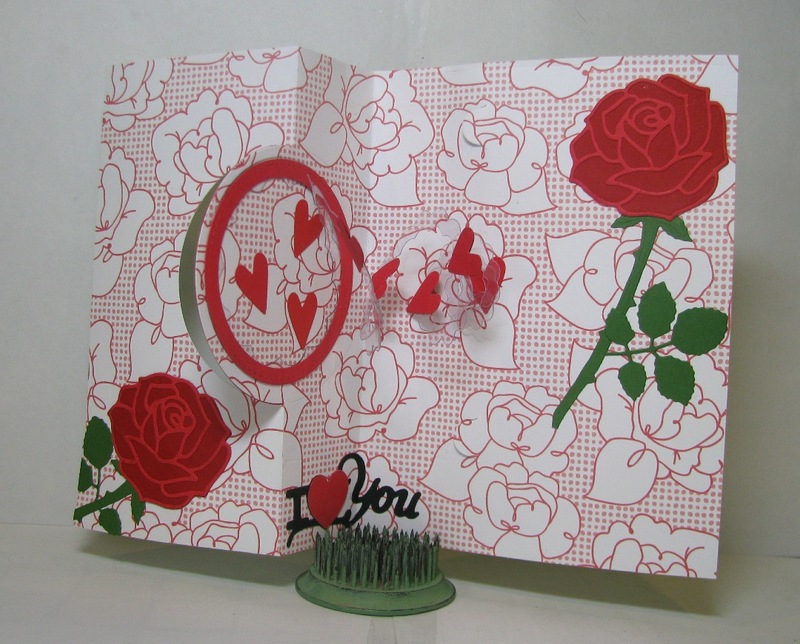 It was a pretty quick card to put together, I could easily make more for Valentine's day if needed. 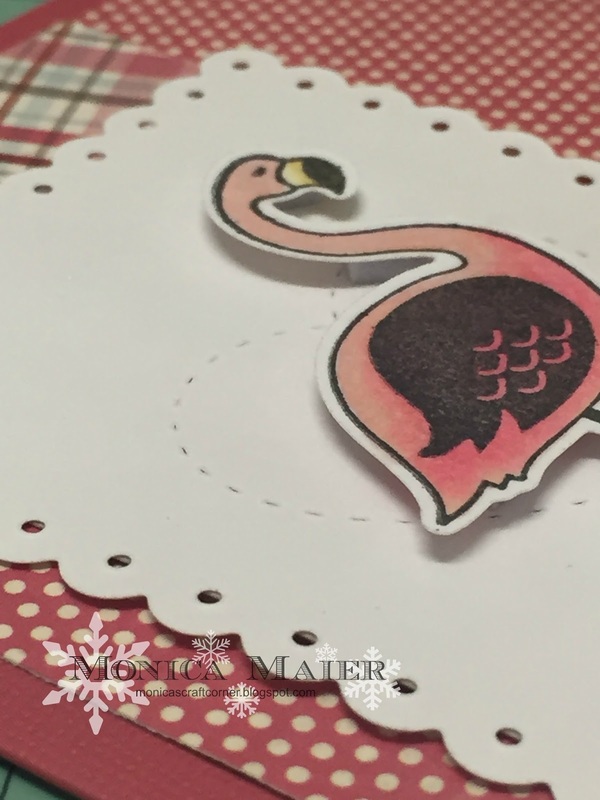 I did pop my flamingo on some pop dots. Here is a closer look at the popped up flamingo and the stitched heart behind him. We have loved seeing everyone's work this month, I know I've been blown away! You guys are so creative, keep them coming only 10 days left for your chance to win!!! A new to me die! They are giving away a $15 gift certificate, so make something with a new die, new technique, new color, etc. You can't win if you don't enter! Here are my cards made with the Elizabeth Craft Designs Spiral Pull die! 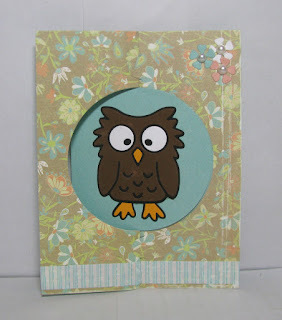 I also used Elizabeth Craft Designs Poppy the Owl and My Favorite Things stitched circles dies. I also used Elizabeth Crafts Designs Roses (But this rose by Frantic Stamper would work well), Cricut Artiste sentiment, and the hearts come in the Spiral Card kit (along with balloons, snowflakes, and leaves). Thanks for visiting, and visit me at Just A Nutter Paper Crafter for more information. 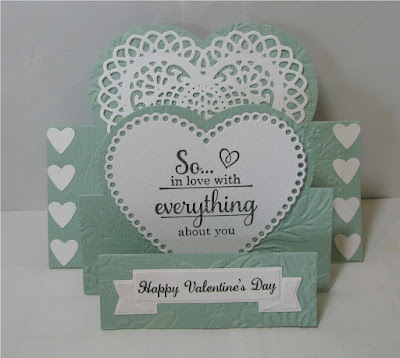 I am super excited today because it's my very first solo post here at Die Cut Diva's. 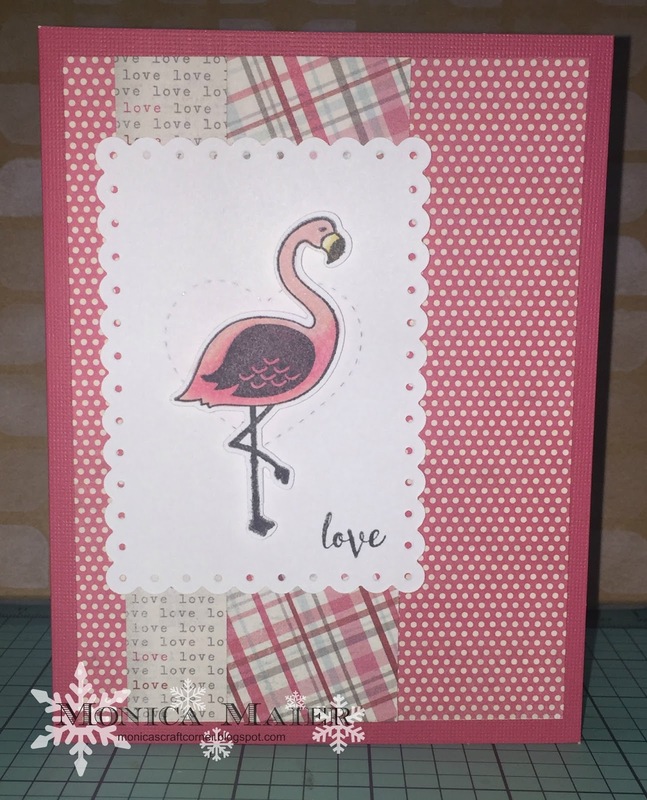 I am new to the team, and this month's challenge is New Technique, Die, Stamp, and/or Colours!! How fun is that?! 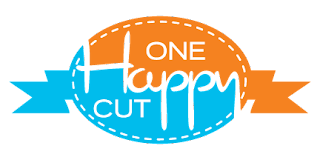 Our great sponsor this month is One Happy Cut. Winner of this month's challenge would receive a $15 gift certificate to their store. For my project I used my new ink: Hero Arts Ombre Tide Pool to Navy, along with the Impression Obsession Dies - Feather set available at One Happy Cut. I pressed my ink pad directly onto water colour paper panel, and I wanted to spritz water all over it to create a water on water look. But I got distracted and left to do something else. By the time I returned the ink has dried! :( But I spritzed water all over it anyway hoping to achieve the same result, sadly it didn't turnout, but this became a happy accident (thus the title of this post), the backside looks very interesting. 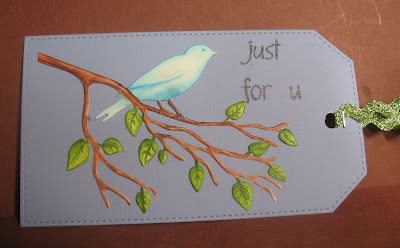 After it dried I die cut the feathers and went ahead to create my card. Here's a look of how I got my feather dies done. 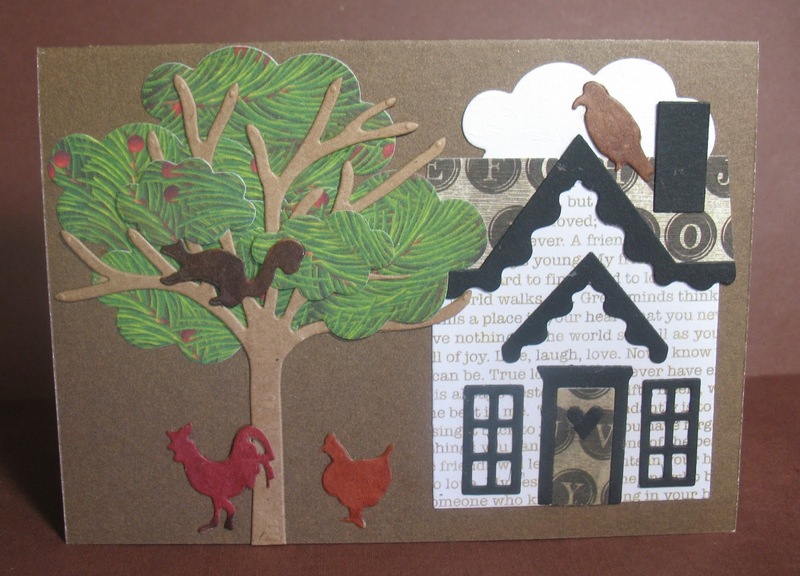 Here's my finished card, I fashioned the feathers like a nest for my bird. 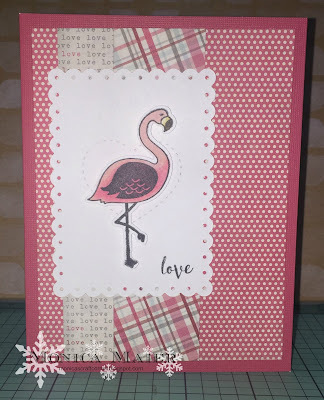 Well its all about new things here at Diecut Divas this month and today I am talking about a new technique and a new stamp. This image is from Sandi Samples and new to me. I also wanted to create a variegated rose look - using copics I tried something new, layering 4 different copics not in the same blending family. I am really happy with how it turned out. Creative Dies tag and sentiment. I have used this die only a couple times and always as a background. I colored this die a few months ago and just never put it on anything. I was waiting for the perfect opportunity to set it apart and let people see the true beauty of coloring a die, rather than a stamp. This is my new technique, color in a die and then make it a focus. Two for One. 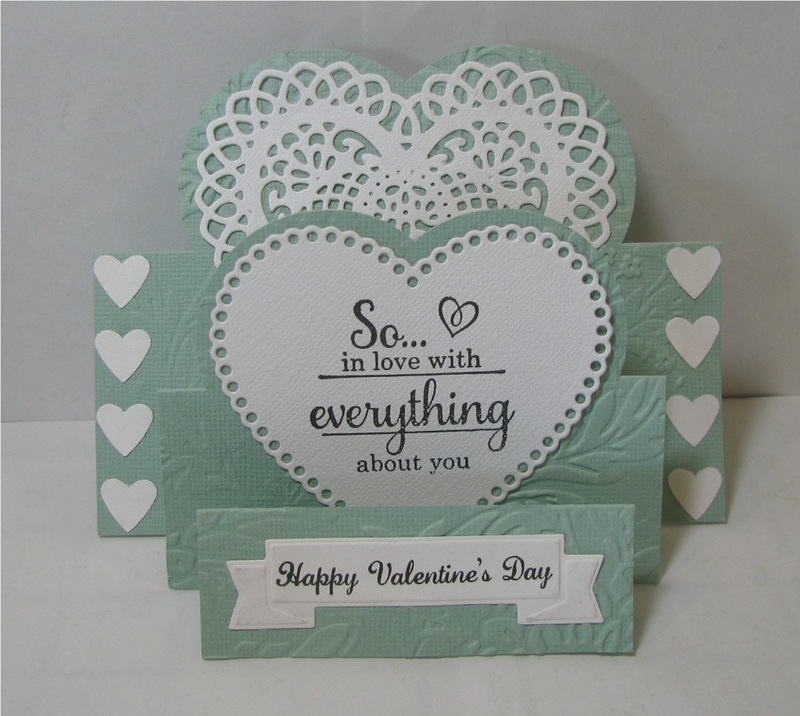 Hello all, Monica here today for the Die Cut Diva's. My new for the card is a technique. 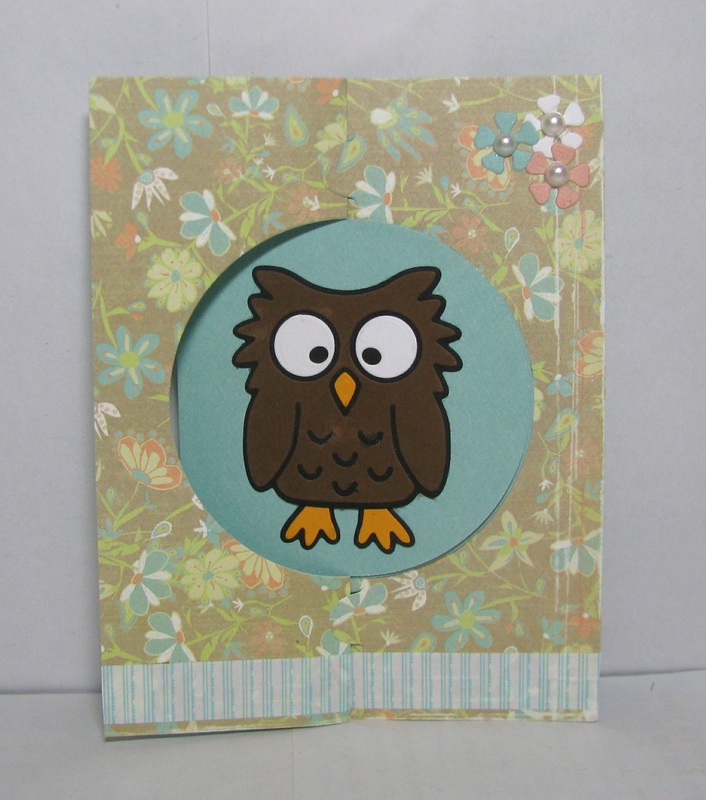 Looking at my card it looks I may have failed my die cutting diva's since this is a one layer card! No worries I still used my trusty Cuttlebug and die by cutting a piece of fun foam to make my own stamp! For more info please visit monicascraftcorner! 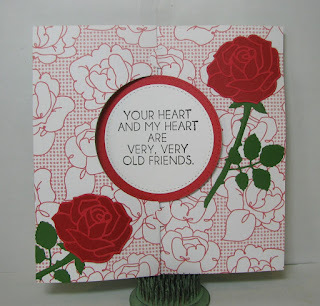 I had this new die for Christmas - Sue Wilson Striplet Collection-Rose Garden. I also used the Sue Wilson Pierced Flags both can be found at One Happy Cut. The Valentine sentiment is cut using a Die'sire die. LeCrystelle Heart tri-fold card (New), Spellbinders Lace Hearts (New die cuts by fellow DT member)(You could also use the Cheery Lynn Two of Hearts set, found at One Happy Cut), Tropical Blooms 3D embossing folder by Cuttlebug (New), Cuttlebug banner from Labels and Such Colleciton (New)(You could also use the Momenta Mix & Match Banner dies, found at One Happy Cut). Come visit me at Just A Nutter Paper Crafter for more information. There will be two winners. Hannah has the honors for December. Sorry for the delay! After the Holiday's were all over I just took the last few days to do absolutely nothing and forgot to announce the Winners! So Here We Go! and for our 2nd #43 Elizabeth H.
Congratulations Ladies!!!! Please email us at thedcdivas@gmail.com and we'll get your prizes to you! 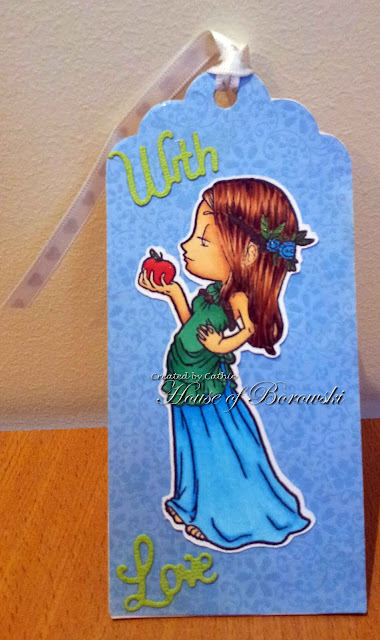 Arlene's Favorite is this cute card. I really like all the white with touches of color to capture me. 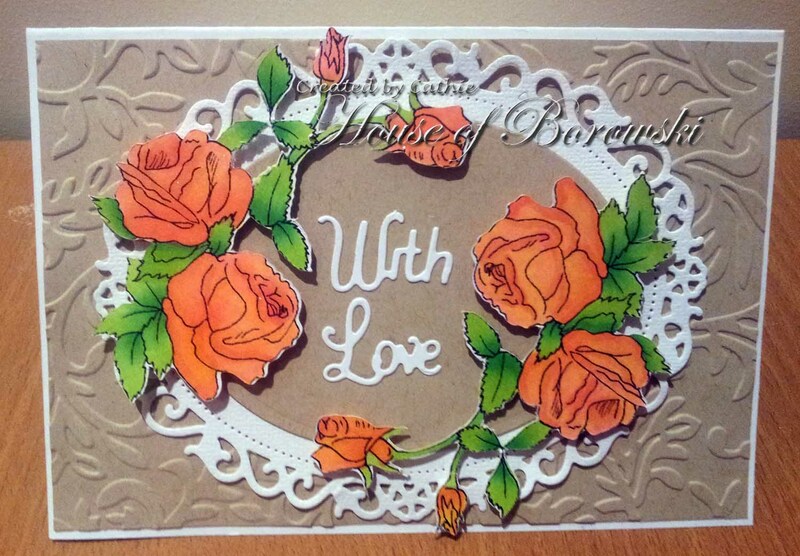 Michelle's Favorite is this colorful card from Dianchik-such great use of color and die cuts! 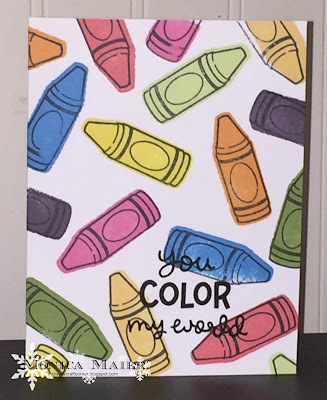 The challenge is new technique/die/stamp/colors, something you're using or trying for the first time. 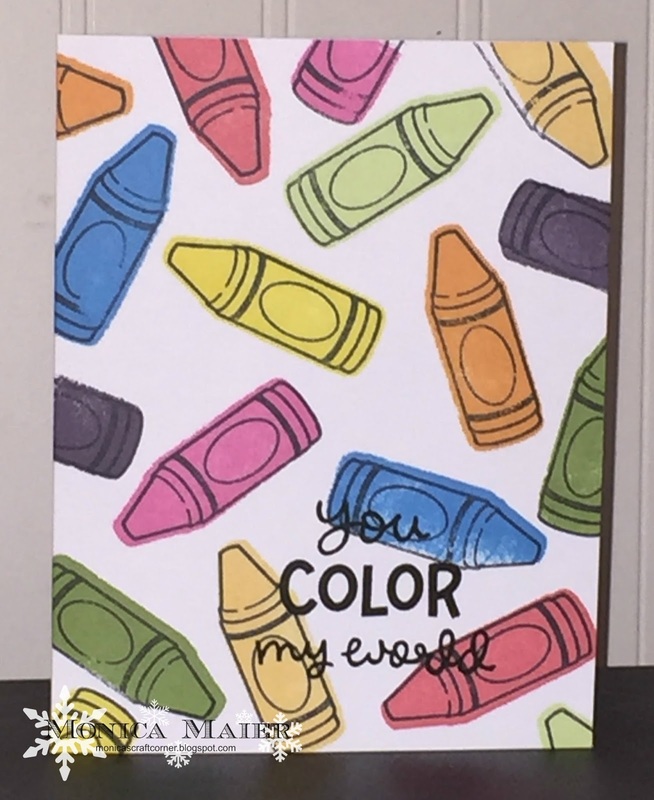 2 Explain what the "new" technique, die, stamp, color combo, etc. is in your post. 4. Only Four submissions to our Challenge per challenge month are allowed. Here are our Divas to start you off for the month. Arlene is showing off the inside of her card, which is the first time she used the adirondack chair.. I viewed youtube videos on the Adirondack Chair and this is very similar to the Karen Burniston video here with the exception of using the hat, sunglasses and flip-flops instead of the cat. See Arlene at A Bit of This and That for supplies. 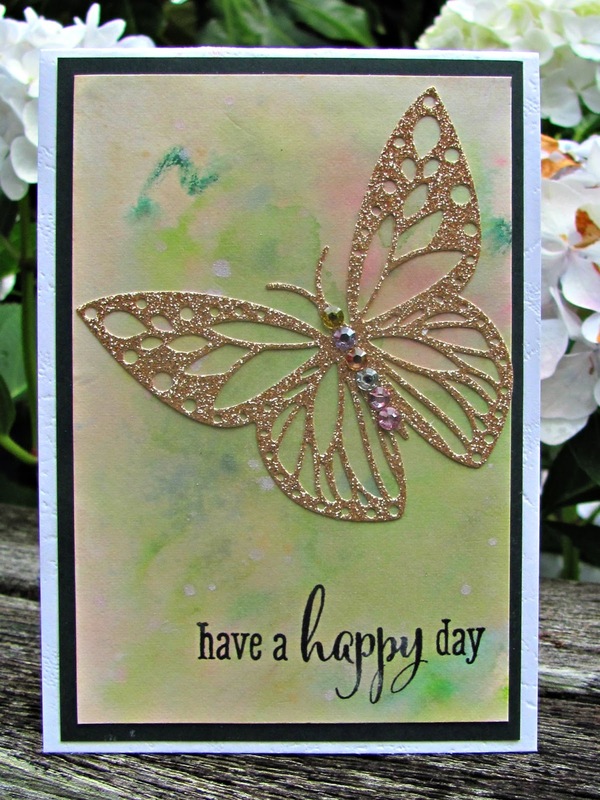 I used an Elizabeth Designs umbrella die to make the butterfly's wings. Second new technique is doing a faux letterpress using a die to emboss on the background.